High Performance Thinking, using sport psychology techniques, is a must read for anyone who wants to improve their performance in any area of life. 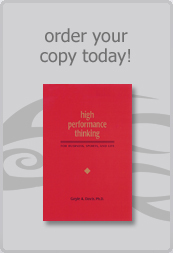 High Performance Thinking can be purchased online direct from the publisher. It is also available at your favorite bookstore. than 45 states nationally and 30 countries internationally. Click here for more about the diversity and significance of her podium experience. Gayle A. Davis Ph.D., a psychologist, is nationally and internationally recognized for her seminars on personal growth and performance in life, sports, and business.